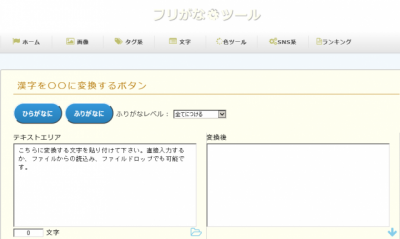 This is a site that lets you easily convert sentences with mixed kanji and kana into hiragana. You can make it all hiragana or leave the kanji and add furigana. Instantly convert sentences that include difficult kanji into hiragana. You can select the level of kanji you want furigana for. You can display the furigana in parentheses beside the kanji. Let's try converting sentences with a mixture of kanji and kana into hiragana. Enter or paste the text we want converted into the text area and click the button for "to hiragana (ひらがなに)"
It has all been converted to hiragana. Next let's try adding furigana on the kanji in the sentence. 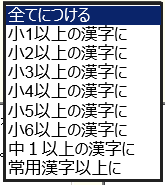 You can select the level of kanji you want to add furigana to from the pulldown menu. We selected the level and clicked "to furigana (ふりがなに)" and now the furigana is displayed in parentheses next to the kanji. Screen after conversion to "kanji for 4th grade and up (小4以上の漢字に)"
Because it will instantly convert long sentences, you'll be able to keep reading without any stress. This content is one of the "Blog HP tools". 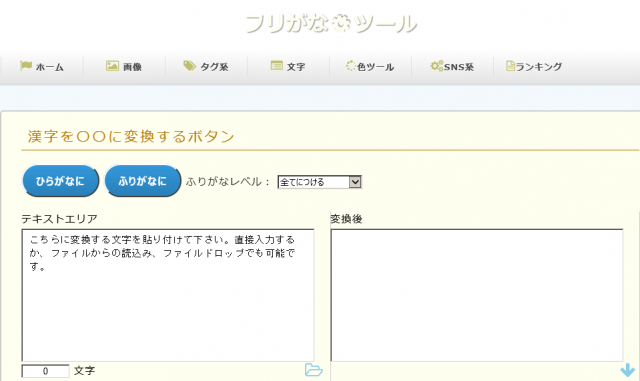 There is also a "kanji conversion tool" that converts hiragana to kanji.